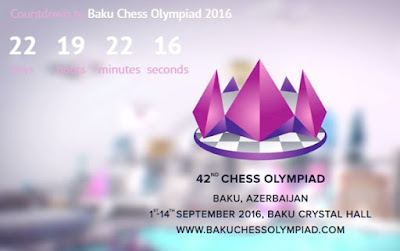 It is about 22 days and 19 hours before the Chess Olympiad 2016 will begin. 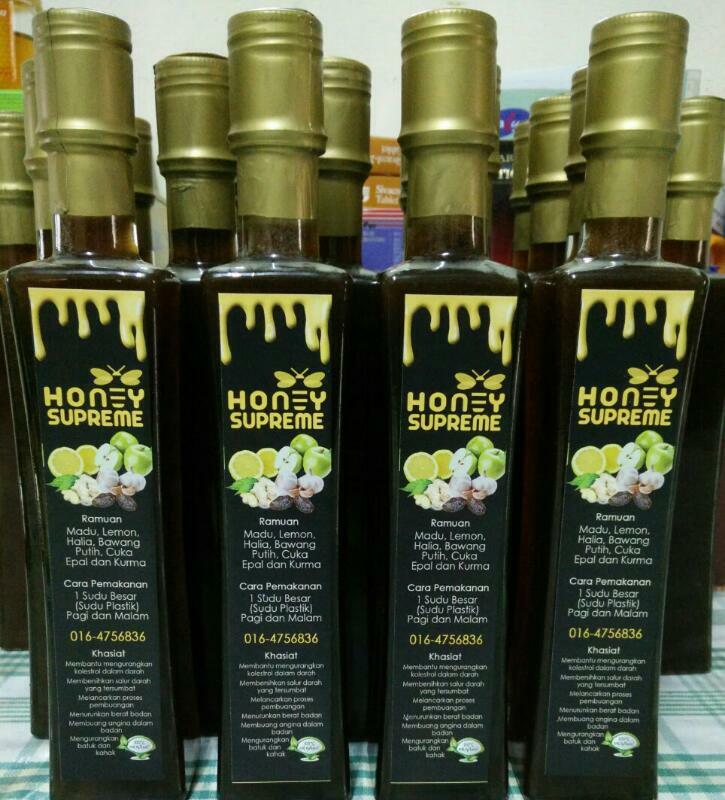 It will be the 42nd edition. The most prestigious biannual chess tournament will be held in BAKU, the capital city of the Republic of Azerbaijan. Let's take a look at the favourite country teams in the Open category. Russia whic is led by Vladimir Kramnik is on the Top spot with average ELO rating of 2760. Team USA is second with average ELO rating of 2740 which include Fabiano Caruana, Hikaru Nakamura and Wesley So. The host country, Azerbaijan, is at the fourth starting rank with average ELO rating of 2705. Among the players in the host country team are Shakhriyar Mamedyarov and Teimour Radjabov. Is the reigning World Chess Champion, Magnus Carlsen, taking part in the Chess Olympiad 2016? The answer is Yes. Let's take a look at the Malaysian team as well as four other ASEAN countries namely Vietnam, The Philippines, Singapore, and Indonesia. Both Li Tian and Mas Hafizulhelmi are not in the list even though both are qualified through the Malaysian Masters selection. GiLoCatur believes Li Tian does not take part due to SPM examination. 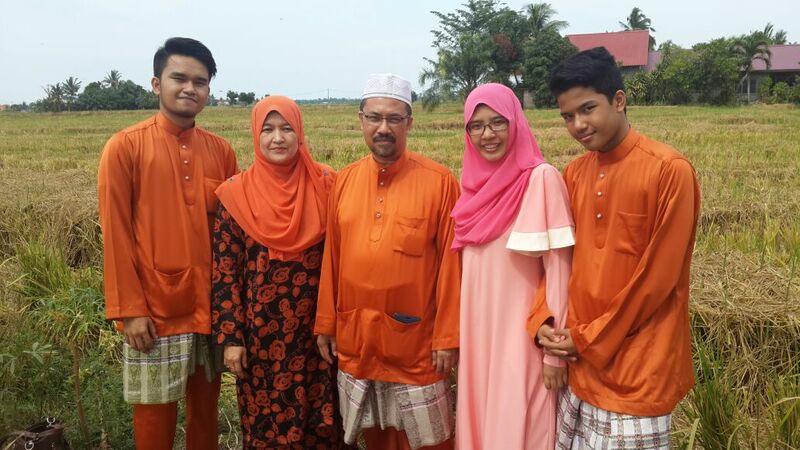 Both of them are replaced by Mok Tze-Meng and Mohd Kamal Abdullah. 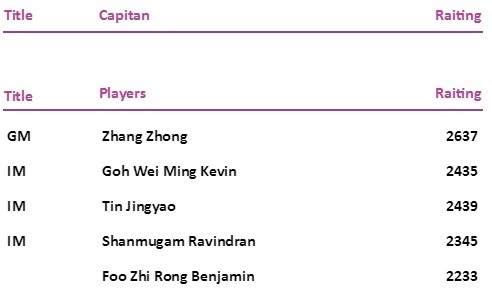 The Malaysian team which is captained by Greg Lau has the average ELO rating of 2200. 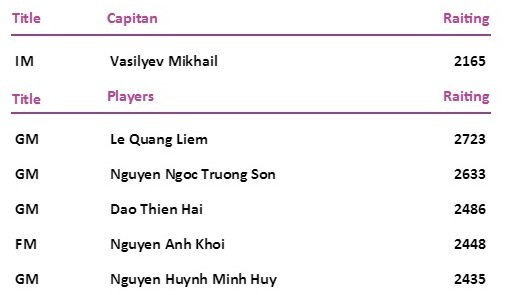 The Vietnamese team is led by its Top 2 chess players - Le Quang Liem abd Nguyen Ngoc Truong Son. Having average ELO rating of 2545, Vietnam is the highest ASEAN country in the starting rank. 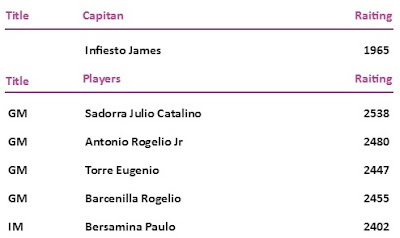 Julio Catalino Sadorra, the top player in the latest Philippines FIDE rating list, is leading the Filipino team. 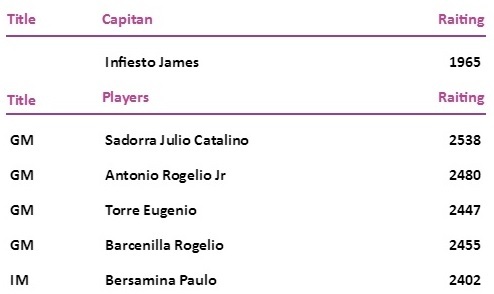 Asia's first Grandmaster, Eugenio Torre is also in the team's list as well as the young IM of Paulo Bersamina. The average ELO rating of this team is 2464, the second top ASEAN country in the starting rank. 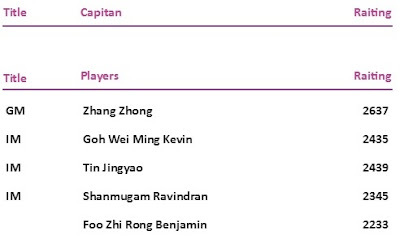 With average ELO rating of 2417, Singapore is represented by one Grandmaster and three International Masters. It is quite surprising to know that the Indonesian top chess player (active), Susanto Megaranto is not in the team list. Instead, Utut Adianto is leading the Indonesian team. 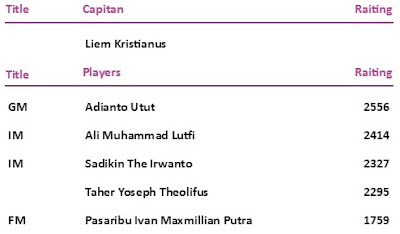 Actually, Utut is still the top-rank Indonesian chess player, just that he is inactive in the FIDE rating list. The average ELO rating of the Indonesian team is just 70 above the Malaysian's which is 2270. The obvious reason is because its fifth player is rated 1759. How these five ASEAN countries fared in the last Chess Olympiad? Vietnam was at 27th place with 5 wins, 4 draws and 2 defeats. Indonesia placed 43rd with 6 wins, one draw and 4 defeats. Meanwhile, The Philippines was 46th after scoring 5 wins, 3 draws and 3 defeats. At 57th place was Singapore recording similar results - 5 wins, 3 draws and 3 defeats, with The Philippines. With 5 wins, 2 draws and 4 defeats, Malaysia was ranked 72nd out of 172 teams in the Open category. .. to continue with the Women category ..